Note: I'll continue my series on prophets soon. But first, this. The saved and immortal Adam and Eve ate fruit for their diet in the Garden of Eden. But when they were expelled from the Garden as a result of the fall, there was a mandated change in diet. The sustaining of their now-mortal lives would require bread, produced by the labors of their mortal bodies. The fact that bread comes from the dust of the earth, and then returns thence, was symbolic of their own mortal journey from dust to dust. Indeed it is symbolic for each of us. "...for dust thou art, and unto dust shalt thou return." It’s interesting to note in the prayer that GOD is the one who brings forth bread from the earth. Man may labor to till and plant, harvest and thresh, but it is God who makes the grain grow. Just as God formed Adam and Eve from the dust, so God forms bread from the dust of the earth. Or in other scriptural language, God turns stones into bread. Therefore, when the Devil tempted Christ in the wilderness to turn stones into bread, the temptation wasn’t about Christ’s physical hunger at all. It was for Christ to prove he was God by doing what only God can do. “IF thou be the son of God…” was Satan’s opening to each challenge. Each of Satan’s other temptations had the same aim in mind. He wanted Christ to prove in a miraculous way that he held God’s power. But to what end? At this point, Christ had indeed received sealing power from his Father, giving him the ability to do the miracles, but this power could only be employed as directed by his Father. Had Jesus employed the power to impress Satan, prove his abilities, or even to satisfy his own doubts, he would have lost that power by its misuse—and thus lost the ability to be our Savior. Satan is no dummy…he knew it was his last chance to destroy Christ’s power before the mission of salvation began. Like every anti-Christ that would follow, the devil demanded a sign. But the only way in which Christ employed that power in conjunction with the devil was to cast him out. Any man can BURN bread into stones, but only God can TURN stones into bread. This metaphor rightly attributes the creative power to God alone. Now, let's think about this lesson, as the Savior applied it in the sermon on the mount. Here, a child asks bread of his father, and his father most certainly won't give him a stone. Since this metaphor is given in the context of "ask and it shall be given you, seek and ye shall find, knock and it shall be opened unto you” (Luke 11:9) the metaphor now expands to the idea of seeking from God the knowledge that will save us. It’s perhaps easy to forget that the key to salvation lies not in our works (we are all sinners) but in our knowledge. The Holy Spirit is provided to give us knowledge. Bread can fill the belly temporarily, but only knowledge of God can fill and save the soul. In the end, this is really a metaphor about revelation through the Holy Spirit. If we ask God, He will give liberally the bread of life, which ultimately consists in saving knowledge. This is the hunger we MUST satisfy. So it’s all about the process of gaining our salvation by gaining knowledge from God and of God. 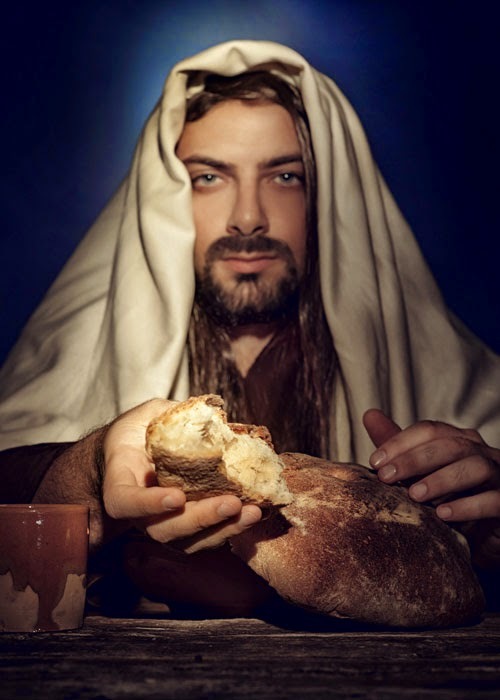 Now in light of all that, we can begin to comprehend what the Savior meant when He said He is the bread of life. (John 6:35) Knowledge of Him is the key to our own eternal life. And so we need Him daily, even from moment to moment, as our hope of salvation from this tabernacle of clay. Thus the broken bread not only represents Christ's broken flesh, but reminds us also of the broken flesh of our own heart as we ponder His sacrifice and our need. 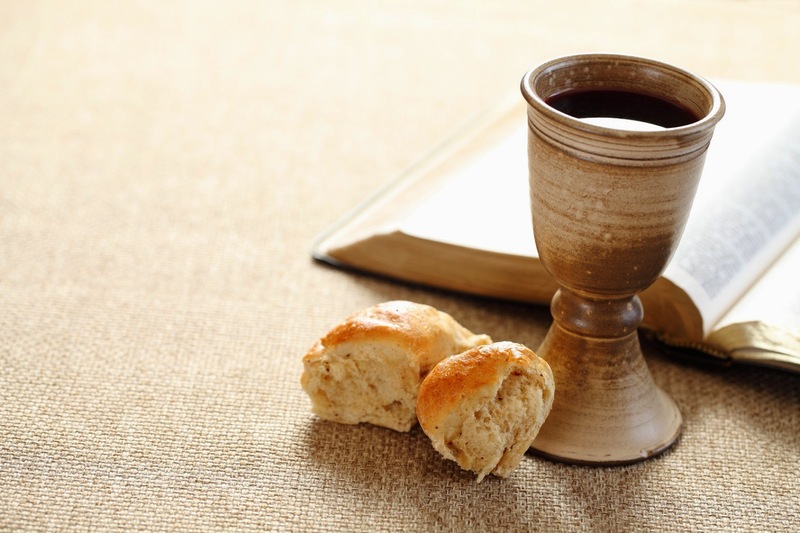 Likewise, the sacramental wine symbolizes our contrite spirit—a discussion for another day. December 21: Winter solstice, when light triumphs over darkness. December 23: The birth of Joseph Smith who would restore light to the world. December 25: We celebrate the birth of Christ—when God condescended to become man, and took upon Himself a tabernacle of clay so He could eventually turn all the stones into bread. You and I—we're the stones. But when our stony hearts are softened, and then finally broken, Christ can work His miracle in each of our lives, thus giving us—and making us—the bread of life. Therefore, with the rich symbolism of bread, stretching all the way back to Eden's garden, is it any wonder that the unregarded little hamlet where the miracle began was called Bethlehem? And so in the house of bread, the manna from Heaven descended to Earth. And so, in light of stones and bread, dust and deity, what is a fitting way to commemorate His birth? This Christmas, why not take a break from the tinsel and toys, gather your family and friends, break the loaf, kneel together and bless it, and partake of the bread of life? Not with a crumb of bread and a thimble of water, but with a feast of bread and wine in remembrance of our Lord! Use the revealed words of scripture in Moroni 4 and D&C 20:76-77. Do it the way Christ instructed it be done. NO MAN has any right, key, authority, control, dominion or compulsion that allows him to forbid you obeying your Lord's commandment. Any man who would forbid it is anti-Christ. Go before your Savior with a broken heart and a contrite spirit. Remember him in the way He asked you to. Make your home a house of bread. We also covered the fact that, without the fruits of prophecy, visions, and revelation, it's impossible to tell if someone is a prophet, seer or revelator. The fruits come by gifts of the Spirit, not by virtue of any office in the church. Sadly, these fruits have been absent from the LDS church for quite a long time—that is, we cannot point to any new revelation, prophecy, or vision to the church in the last hundred or so years. When I have pointed out this fact to my brothers and sisters in the church, and even church leaders, the most common reply is that we receive revelation at every General Conference. Indeed, some regard every talk by the members of the First Presidency or an apostle as revelation—because these men are sustained as prophets, seers and revelators. I disagree. As I discussed previously, prophecy and revelation are different than inspiration. Many church leaders give inspired talks by the power of the Spirit, teaching great truths. 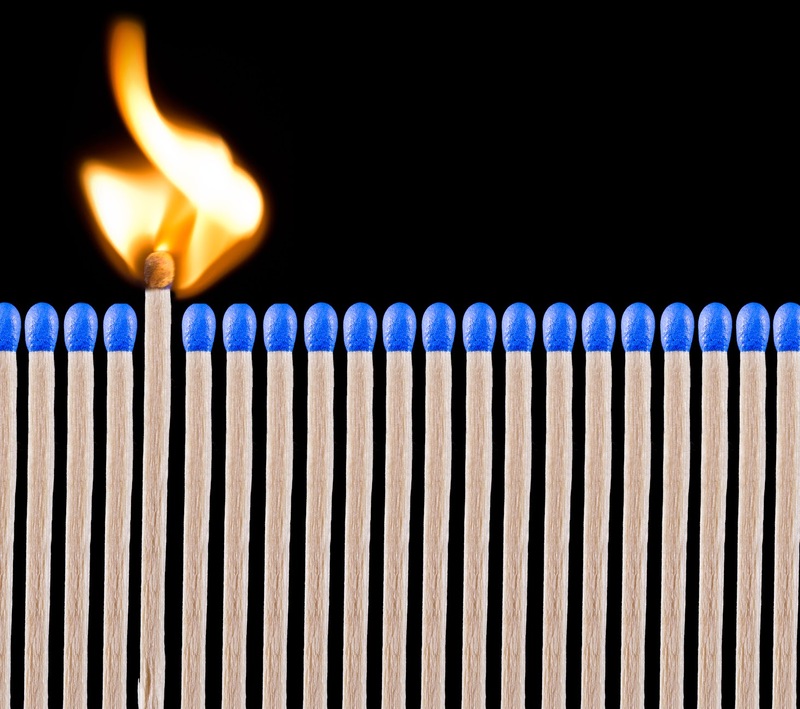 Many General Conference addresses share this common inspiration and are filled with light. But revelation is something more. Prophecy is something different than just a great talk. Allow me to illustrate what I mean. For purposes of this discussion, let's accept the proposition that our sustained prophets give revelation at every General Conference. In fact, to make things simple, we'll confine our search to just the President of the Church. Nobody will question that he is certainly accepted and sustained as a prophet, and therefore the common belief is that his words are revelation to the church. Therefore, since he is issuing revelation as a prophet, his talks should be qualitatively different than what is offered by, say, a member of the Second Quorum of Seventy, the Presiding Bishop, or the Relief Society General President. If you take the names off the talks and simply read them, you should be able to pick out the revelations of prophets, which are different than the talks of non-prophets, right? Try these. Which of these was spoken by a prophet at General Conference? Pride is essentially competitive—it is competitive by its very nature...Pride gets no pleasure out of having something, only out of having more of it than the next man. It is the comparison that makes you proud: the pleasure of being above the rest. Once the element of competition has gone, pride has gone....it is pride which has been the chief cause of misery in every nation and every family since the world began...pride always means enmity—it is enmity. And not only enmity between man and man, but enmity to God. Are we really aware of the perilous circumstances surrounding our own children? We can usually determine if their physical needs are met, but what about their spiritual needs? Do they know of the light and peace of the gospel of Jesus Christ? The scriptures teach, “All thy children shall be taught of the Lord; and great shall be the peace of thy children.” Children need the peace that comes from knowing they have a loving Heavenly Father, who sent His Son, Jesus Christ, to bring light and hope into the world. It is up to us as adults to direct children to that peace and light. Many people are longing not only to be loved but to have someone who will listen to them. When we love God with all our hearts, then we have the capacity to love our neighbor. The greatest need in the world today is not more science, not more social engineering, not more teaching, not more knowledge, not more power, not even more preaching-the greatest need we have today is for love. 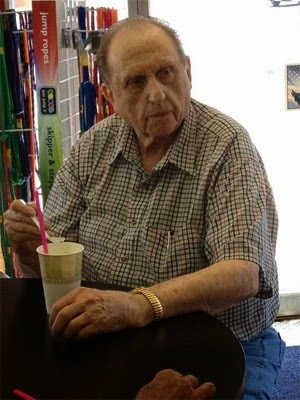 Number one was spoken by President Monson in the October, 2009 General Conference. These are the words many will elevate above the others and call them revelation. Read them again. Any new revelations there? Number two is tricky. These are the words of Christian author C.S. Lewis, but some of them were borrowed by Ezra Taft Benson for his April, 1989 General Conference address. When the words originate with a non-prophet, but then are spoken by a prophet, do they become elevated to revelatory status? Number three was sister Coleen K. Menlove, Recently Released Primary General President, from the April, 2005 General Conference. Number four came from Christian evangelist Billy Graham. Now, I'll admit that such a test as I just offered is necessarily limited. I've only taken excerpts of talks, devoid of context. But I did that intentionally to focus on the message, rather than the setting in which it was offered. Nevertheless—and I won't take the space here to do so—I submit that you could do the same with entire conference talks. Take off the speakers' names, then try to pick out the talks of prophets vs. non-prophets. Could you conclusively say what is revelation and what is merely inspiration? This was brought to my attention forcefully, when someone emailed me a link to a fictional general authority website, containing absurd parodies of General Conference talks. The site was sent to me in the context of being an important addition to the topic at hand. It wasn't until a couple of days later, as I recall, that the sender realized the deception and told me the site might be fake. Hey, if you use the right vocabulary, speak the correlated phrases, and parrot what other general authorities have said, guess what? You'll sound just like them. And that's just the point. Men and women, even children, speak inspired words and teach beautiful truths. People of all faiths do so. LDS leaders certainly do. Calling such words prophecy or revelation because they come out of one person's mouth, but merely a good talk when they come out of another person's mouth makes the owner of the mouth the most important deciding factor in discerning truth. It elevates the speaker above the message, and relieves us of our obligation to seek confirmation from God. It makes a man into an idol and God's word into a secondary consideration. This is against Christ's injunction to know the man by the fruits, and not the fruits by the man. Most important, such an idea supports the notion that God's words are really no different than man's words, and that revelation and prophecy are really no different than any other banal platitudes that may be offered as religion. You may not want to read what follows. It's a harsh reality, but it wasn't my idea. No, it's an idea promoted by the LDS Church. More specifically, I got what follows from an article in LDS-church-owned magazine, LDS Living, in which a quiz was offered comparing the words of LDS prophets to those of Disney characters. Check it out at this link. Yes, that's right. 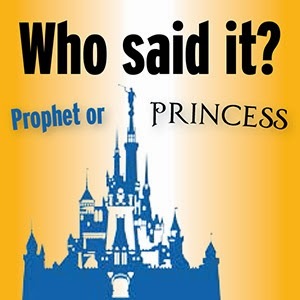 Prophet or princess? Hard to tell? That's what makes the quiz so fun! The words of the prophets are entertaining! It's not like your soul is at stake or anything. Have some fun! Though I write a lot of stuff, there are times when I'm so caught off guard that I'm at a loss for words. Are you SERIOUS? Let's compare what we claim are the direct words of Jesus Christ—to vapid platitudes of Disney Princesses? For fun? And THIS is what passes for revelation? THIS is how we claim to receive the very oracles of God? THIS is where so many of us will hang our salvation, secure in the knowledge that we can never be led astray? Allow me to quote another animated, fictional character—namely, Homer Simpson: "Feeling stupid? I know I am!" But it's OK, because in the words of the Pooh prophet Winnie: "You're braver than you believe, and stronger than you seem, and smarter than you think." And it's a good thing, too. 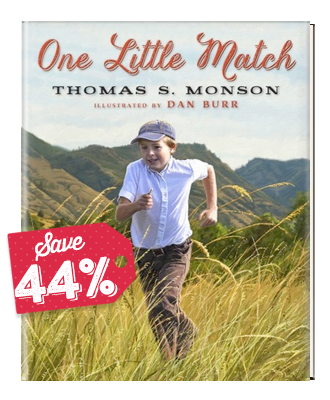 Because you're going to need those smarts to beat the next quiz (Again promoted by the LDS church in LDS Living magazine). 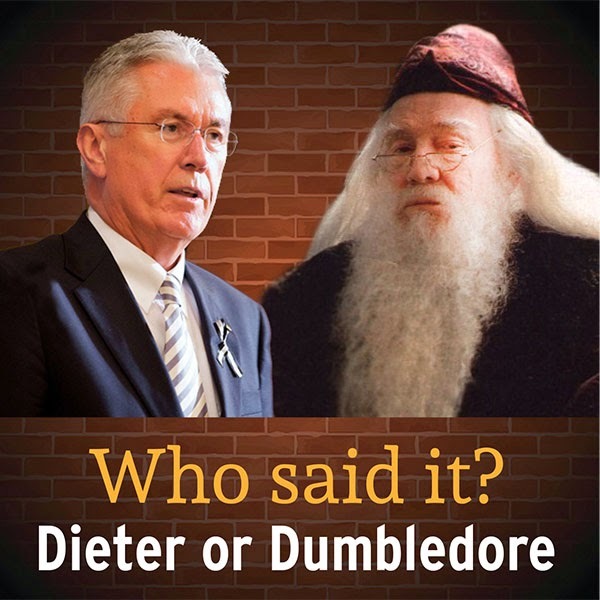 That's right, it's time to play Dieter or Dumbledore! In this fast-paced religious extravaganza, you get to guess which hackneyed clichés were uttered by fictional wizard Albus Dumbledore and which were spoken by prophet, seer and revelator, Dieter Uchtdorf. After all, as the introduction states, "They both have silvery hair, speak with foreign accents and are known for their wisdom." Having trouble? Here's a hint: if it's about flying a plane, it's Dieter. If it's about flying a broom, it's Dumbledore. You're welcome. Would we ever play such games with the words of Christ? Isn't the fact that we play such games proof enough that, though we claim the prophets speak for Christ, we don't really believe they do? Do we not show, by our own works, that prophecy has ceased? When those we call prophets only offer what is commonly available and ceaselessly repeated every six months, how will we ever know God's will? What are we to do in such circumstances? Well, it ends where the restoration began, with James 1:5. But seeking Him will take work. And faith. And it may require letting go of cherished, but false, traditions. And that might be uncomfortable. So it might be more entertaining to just go read this article about what prophets have said on the topic of Santa Claus. Oh—and I hear the Muppets are delivering the glad tidings of great joy this year too! My brethren, all ye that have assembled yourselves together, you that can hear my words which I shall speak unto you this day; for I have not commanded you to come up hither to trifle with the words which I shall speak, but that you should hearken unto me, and open your ears that ye may hear, and your hearts that ye may understand, and your minds that the mysteries of God may be unfolded to your view. Update December 29, 2017: Those tricksters at LDS Living are at it again! Here's a fun quiz they put together, where you can try to tell the difference between the words of J.R.R. Tolkien, C.S. Lewis, and living prophets and apostles. Remember, "Their wisdom is timeless and their words touch our hearts." The tricky bit: Many of the quotes from Lewis and Tolkien were used in General Conference...so...does that make them prophetic? Mommy, where do babies come from? Different explanations are offered for different levels of understanding: The stork, the baby store, the hospital, mommy's tummy, and eventually the biological realities of reproduction are explained when there is sufficient maturity to understand and use such knowledge properly. Religion works in much the same way. We teach children simple truths, which they accept in simple faith, and as they mature, we increase the depth and breadth of teaching so they can gain a fuller understanding and exercise greater faith. Putting away childish things in our gospel understanding is absolutely necessary, though often uncomfortable. Ironically, receiving greater light and knowledge requires us to become more childlike; the more open we are, the more our hearts are soft and willing, the greater our capacity to understand truth. Being childlike in our openness is not the same as being childish in our understanding. And so, we come to the topic of prophets. As Mormons, we unequivocally believe in prophets and prophecy, so it's worthwhile to study the topic. In doing so, we must let go of our preconceived ideas and biases so we can be soft hearted and open to truth, even when it's uncomfortable. The path to Christ's redemption was never designed to be comfortable, popular or easy. 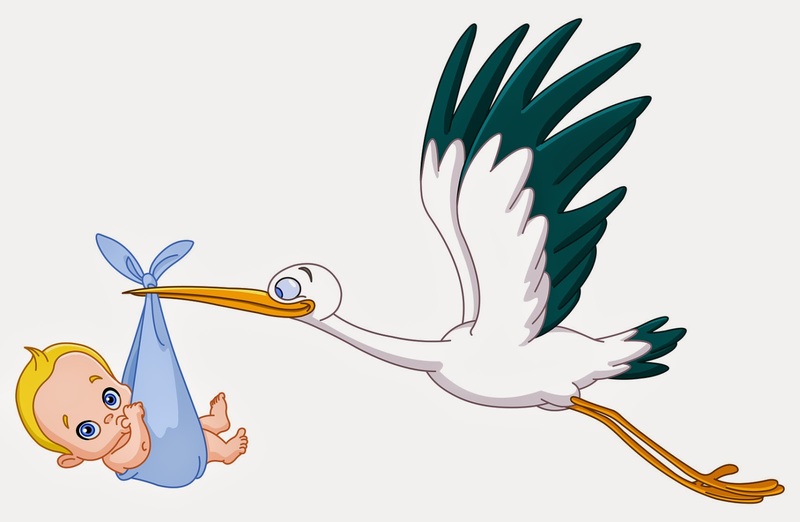 No matter the stories we may tell our children, neither babies nor prophets are delivered by storks. Do you Sustain the Prophet? These are interesting questions to ponder, particularly if you don't just answer with a knee-jerk "Yes!" reaction. It's worth considering what it means to "sustain" a man as a "prophet, seer and revelator." As with all questions affecting our salvation, we ought to take this question seriously. Now the first thing we have to get straight is this: The titles "prophet, seer, and revelator" do not refer to priesthood offices. You CANNOT ordain someone "prophet" or "seer" or "revelator." I've heard people talk about the President of the church being "ordained to be the prophet." This may be the colloquial usage among us Latter-day Saints, but it is not correct. The President of the church is ordained to be the President, which is an administrative office—not the Prophet, which is a spiritual gift. The titles of prophet, seer and revelator all refer to spiritual gifts. And according to D&C 107, it is the duty of the President of the church to obtain and exercise these gifts. Upon the death of the current President, the next-most-senior apostle is automatically installed as the legal president of the corporation. There is no provision for discussion, dissent, or direction from God. It's written in the corporate charter and is legally automatic and instant upon death as part of the corporation's contract with the state, not God. Sometime later, the new President is sustained by the vote of the church membership in General Conference. Being that the man is already legally installed, and ordained, the vote is merely symbolic. There is, in reality, zero chance that the vote would ever choose anything different than what has already been done, nor is there any procedure in place to change anything even if the vote did come out against what had been done. Having thus been legally installed, ordained and sustained in precisely backwards order from what it should be, the President is now obligated to seek and obtain the gifts of Prophecy, Seership and Revelation. It is his duty (D&C 107:91). He can be sustained by our vote, and ordained to an office, but this does not obligate the Lord to bestow any specific spiritual gift on that man. An office is no guarantee of any spiritual gifts at all. We cannot vote the gifts to descend upon the man. Only God can bestow the spiritual gifts the President is obligated to seek. 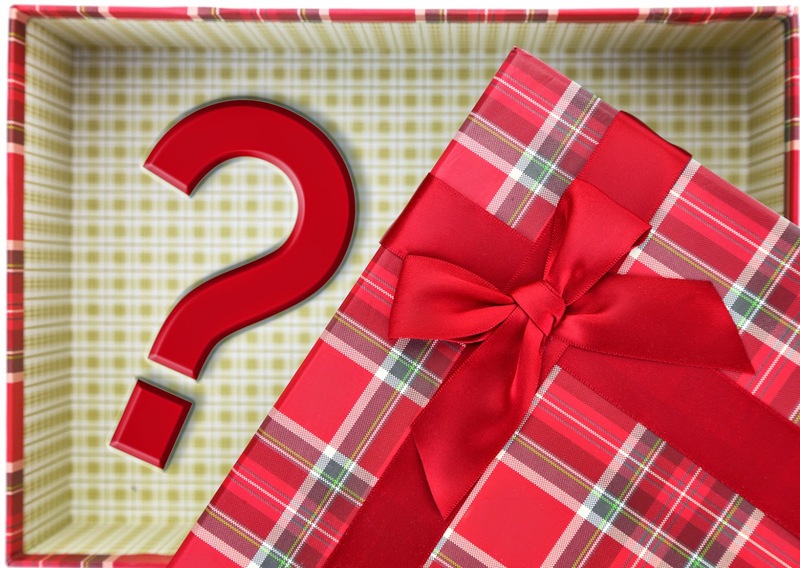 To better understand these gifts, let's examine them one at a time. It's a simple concept. By definition, a "prophet" or "prophetess" is one who has the gift of prophecy. (D&C 46:22). Such a person receives and delivers a message given them by God. Our common usage implies such a message will deal with future events, but the timing is not the defining characteristic of prophecy. Rather it is the source. Prophecy MUST originate with God. There is no scriptural mandate that there be only one person with this gift at any given time, or that there only be specific leadership offices that enjoy this gift. Jesus taught us to expect prophets, and discern false prophets from true prophets by their fruits. (Matthew 7:15-20) If the fruit of a prophet is his prophecy, then we ought to judge the prophet by the message he delivers. Note that Jesus DID NOT say we could recognize a prophet by office, title, position, credentials, family, education, wealth, power, achievements, honors of men, success, accolades, or even common consent. These are all false standards, valued by this fallen world, but completely irrelevant to heaven. God chooses whom He will, and teaches that person. This is the only credential a prophet needs. The message is both the credential and the fruit of that prophet. If someone delivers a message from God, the message is all the authority needed. Such a messenger is, in delivering that message, a prophet. Therefore, if we are to judge by fruits, we must examine the prophecy of the prophet to discern a true prophet from a pretender. If a man has never issued prophecy, there is nothing by which to judge. In that case, it's much like claiming to be a dentist, without ever having actually looked in someone's mouth. If you can't do it, you can't claim it. And it doesn't matter how many people may call you a dentist and testify that with every fiber of their being they KNOW you are God's chosen dentist and his mouth-doctor on earth. Until you fill the cavities, you haven't demonstrated you're anything but a title. A prophet, then, has the obligation to make it clear when he is prophesying, or delivering a message given him by God so we will know it is prophecy and not just a good talk. "Thus saith the Lord" is a common scriptural marker. Or "the word of the Lord came unto me saying..." Others express it in other ways. King Benjamin made it known that he received his message from an angel. Jacob said he obtained his errand from the Lord. The key to remember here is that prophets clearly identify their prophecy as originating with God. We are never left to guess or make claims on their behalf that they do not make. Joseph Smith said a prophet is only a prophet when he is acting as such (DHC 5:265). This means that everything coming out of the prophet's mouth is NOT prophecy, and may also include opinions, teachings, and administrative pronouncements. In fact, the majority of what such a person speaks will NOT be prophecy. An example would be when Joseph Fielding Smith, at the time President of the Quorum of the Twelve, stated over the pulpit in 1961 that man would never go into space or reach the moon. Obviously, he was expressing his own opinion, later proven to be erroneous. The fact that he said it "in the name of Jesus Christ" and over the pulpit did not change the fact that it was mere opinion. And it's OK—he, like all men, is entitled to hold opinions and make mistakes. He did not say the Lord said it; he was not issuing prophecy. And yet, if everything coming out of a prophet's mouth were prophecy, such errors would be hugely problematic and faith destroying. Therefore the prophet must identify clearly that which is, indeed, a message coming from the Lord. Unless a statement is identified as prophecy, the only safe course is to assume it is not. Ask yourself, then: When is the last time you heard such a message identified and delivered by a living prophet (or heard it read to you from a teleprompter)? Who is the last man you know of who openly claimed to have met the Lord or an angel and to subsequently deliver a message from God? Or have you ever heard of such a message in your lifetime? Joseph Smith made it clear when he was delivering God's word. He was unquestionably a prophet. Do we hear such a voice today? Or have we changed the definition of "prophet" and "prophecy" to conform to our current situation? But a seer can know of things which are past, and also of things which are to come, and by them shall all things be revealed, or, rather, shall secret things be made manifest, and hidden things shall come to light, and things which are not known shall be made known by them, and also things shall be made known by them which otherwise could not be known. Therefore, it's a fairly simple proposition for us rank-and-file church members to recognize a seer. He or she will have visions that reveal things that otherwise could not be known, and will make those things known unto us. Joseph Smith is a great example: His First Vision opened this dispensation, and he had, and revealed, other visions throughout his life, up to and including the night before he died. Joseph Smith was unquestionably a seer. If we are looking for modern seers, we should identify them by the visions they receive and make known. 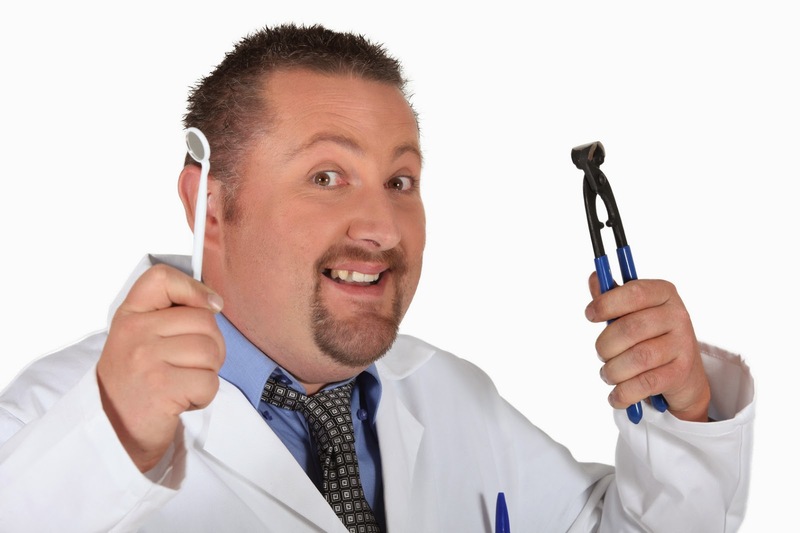 And so we're right back to our dental analogy: Calling someone a seer who has never looked into heaven is like calling someone a dentist who has never looked into a mouth. If you can't do it, you can't claim it. Calling someone a seer doesn't make him one. Who is it today that looks into heaven and tells us what he sees? What visions of Heaven have been delivered to the LDS people? When was the last such vision given? The word "revelation" is based on the word "reveal," which means to make known what was previously unknown. Or, as Noah Webster put it in 1828, "The act of disclosing or discovering to others what was before unknown to them." And what "bringeth life eternal?" Knowledge upon knowledge, the mysteries, the peaceable things: ultimately the knowledge of God. Therefore, if there is a revelator among us, he will reveal unknown knowledge. Mysteries. The truths of God. This is not the same thing as giving a good sermon by telling stories, quoting poets, or even teaching from the scriptures. You and I can do that. General authorities do that. TV evangelists do that. Many preachers of many different faiths teach great truths and give good advice. This is NOT revelation, even when it is based on scripture, because this is only expounding on principles that are already known and sitting in front of us in scripture. However, from Joseph Smith's first vision to his last, he revealed NEW truths from God. Joseph most certainly had the gift of revelation. D&C 107:92, quoted above, also requires the President of the church to be a translator. In fact the title “translator” appears every time this list is applied to Joseph Smith (D&C 107:91-92, 124:125), though for some reason we choose to ignore that particular gift when referencing the current President of the church. Why is that? I suspect it’s because nobody has translated anything since Joseph, and it feels ridiculous for us to call our leaders translators when they clearly don’t translate. For example, when the Book of Mormon and Doctrine and Covenants have been translated from English into other languages, it has been by committees and scholars, not by “prophets, seers, revelators and translators.” Similarly, when various groups have approached the First Presidency with purported ancient records to be translated, the First Presidency has declined to do so. This is food for thought. In our day, the church either doesn’t believe in the gift of translation, or doesn’t have it. It’s one or the other. Either way, when the church needs translation, it's the scholars, not the prophets, who do the work. The scriptural references to prophet, seer, revelator and translator all applied to Joseph Smith, who had, and amply demonstrated, those gifts. It was Joseph, specifically, who was to speak for the Lord (D&C 5:9-10, D&C 21:4-5). There is no mention of a successor in that capacity. In fact, the Lord specifically declares that no other man can act in this capacity (D&C 28:2, D&C 43:1-5) unless Joseph appoints him. Incidentally, Joseph did in fact appoint his successor by revelation while he was alive. It was Hyrum. But the question of succession necessarily brings up the question of gifts. Remember, you cannot "ordain" someone to these gifts. You cannot vote them these gifts by common consent. Rather, these gifts must be obtained by the individual, directly from God. Preside over the whole church. Simple enough. He’s the highest authority. This President of the high priesthood is beginning to sound a lot like Joseph Smith again, isn’t he? Notice the dash after “like unto Moses—“ which indicates a continuation of the thought—and a wise one at that. "Here is wisdom; yea, to be a seer, a revelator, a translator, and a prophet." These are listed as duties of the office. Or alternatively, we could take it to mean that the only person eligible for the office of President is one who has obtained and demonstrates these gifts, and such a person should be sought and installed by common consent. Either way, there is no basis to claim from scripture that anyone automatically obtains the gifts of the spirit simply because of office alone. "having all the gifts of God which he bestows upon the head of the church." Some have claimed this passage means that God automatically bestows these gifts on the President of the church. But I have a question. Who is the head of the church? Therefore, a valid way to read this passage is that we would be wise (hence “wisdom”) to choose men who are prophets, seers, and revelators to be our leaders. In fact, we should choose men like Christ, having all the spiritual gifts, if we can find such men. Such would be "like unto Moses" indeed, who was in similitude of Jesus Christ. This would fit the scriptural pattern the Lord has stipulated. And such leaders wouldn’t have to rely on public-opinion polling, high-priced marketing firms, lawyers and image consultants to determine doctrine and change ordinances. (oh, I wish I were exaggerating.) But sadly, we’ve established an order of legal succession (not in scripture) and we don’t dare depart from it, all the while telling ourselves we really didn’t lose anything when we lost our prophet, seer, revelator and translator, Joseph Smith. Other men claim those titles today, and therefore we have the obligation, imposed directly by Jesus Christ, to know them by their fruits. Similarly, such men have the obligation to provide those fruits—revelations and prophecy that can be examined by us, taken to the Lord, ratified by the Holy Ghost, and accepted by the membership. So in the next part of this series, we'll do as Jesus directed, and examine the fruits. We'll also talk about what it means to "sustain" our leaders. ¶Beware of false prophets, which come to you in sheep’s clothing, but inwardly they are ravening wolves. Ye shall know them by their fruits.